Pastner and U of M athletic director Tom Bowen met briefly with the press this afternoon at the Hardaway Hall of Fame on campus. Describing the new agreement with Pastner as "sound" and "long-term," Bowen declined to share details of the extension (number of years or annual salary). Bowen said the process for the new agreement began several months ago. 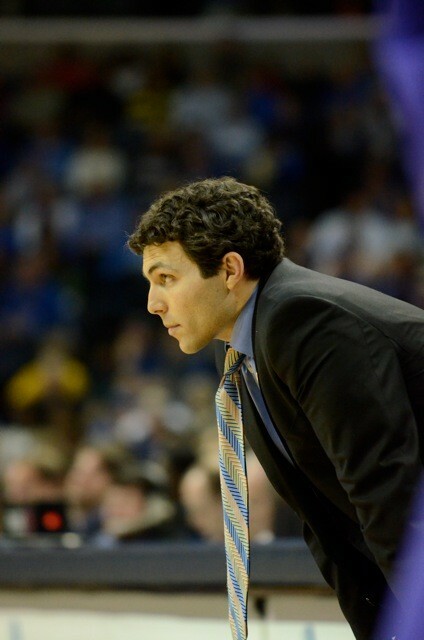 Pastner said he did not receive any job offers since the Tigers' season ended Saturday. Pastner earned his first win as a head coach in the NCAA tournament last Thursday when Memphis beat Saint Mary's in Auburn Hills. The team won Conference USA's regular season title for a second straight year, and the C-USA tournament for the third year in a row. The Tigers completed their final season in C-USA with a record of 31-5 (19-0 in league play). After four seasons, Pastner holds a record of 106-34. "I'm very grateful to be the head coach at Memphis. It's a privilege. Tiger Nation is phenomenal, the best fan base in the entire country. Even in times of loss, that's what makes it great: their passion and involvement." "When you've done a good job, your name is going to be thrown out there. I don't think there are any issues with talking as long as your bosses are kept in the loop, and that goes for any walk of life. That means you're doing a good job. Memphis is an elite job. Ninety-nine percent of programs are on page 9-C. Here, we're on page 1-C."
"I'm a pretty simple guy. I believe in giving back [to the community]. Whether it's right or wrong, coaches' salaries are about the market. I like to help as many causes as I can, whether it's with my time or financially. I never let anyone pick up the tab at dinner, and I tip very well. Everything's a gift. I don't take this for granted. I'll be the same guy." "I've started to meet with all the players. First and foremost, I want the guys to finish academically. The new rule with the NBA, you only have until April 15th. You're in or you're out. I never tell the guys what they should do. They have to make the best decision for them. But I believe our core group will be back. We have a chance to be really special next year. We could be a preseason top-10 team. With tremendous exposure in the new league." "We will never not have good players. You have my word. A really good coach is one that can win with no talent. I never want to be a really good coach. I'll be happy being an average coach, and let's go get great players." The Tigers, when faced with stiff competition, lost all five times. There are analysts, near and far, who will tell you today that Memphis just completed the most predictable season in the 83-year history of the program. They would be wrong. One fact is as predictable as the flow of the Mississippi River, but it goes for every Tiger season: The coach is a failure without a run in the NCAA tournament. (And a two-point win over a “first four” survivor doesn’t count as a run.) However positive his pitch, Josh Pastner will have to coach his team to the second or third week of the NCAAs before he’ll be universally accepted by the program’s legion of passionate followers. This fact is predictable, tiring, and won’t be discussed further in this column. What was surprising about the 2012-13 Tiger season? Let’s examine things from the perspective of the seven players who finished the season in Pastner’s rotation. Joe Jackson is a mercurial, me-first point guard who will lose as many games as he wins. Tiger fans were shaking their heads last November 23rd, when Jackson seemed to quit during the Tigers’ loss to Minnesota in the Bahamas. After playing seven uninspired minutes in the first half, Jackson watched from the bench the entire second half. It was no place to be for a veteran point guard, one who had earned MVP honors at the Conference USA tournament as both a freshman and sophomore. It was the last truly “bad Joe” we’d see all season. Jackson reeled off 16 consecutive games with at least 10 points, including 23 against mighty Louisville and 20 at Tennessee. In scoring 26 at East Carolina on January 30th, Jackson joined the 1,000-point club just 20 games into his junior season. In the regular-season finale, he came one rebound shy of the program’s fourth triple-double. (Heart? 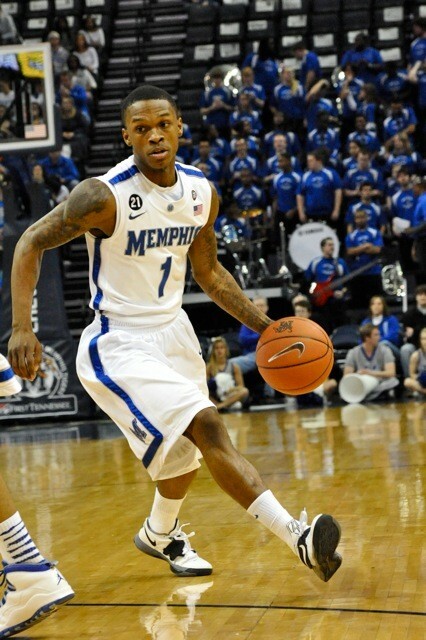 Jackson led the Tigers with seven rebounds in their NCAA tournament loss to Michigan State.) His numbers for the season were hardly off the charts: 13.6 points and 4.8 assists per game. But this was Jackson’s team, and for his efforts in leading the Tigers’ 19-0 farewell tour of the league, he was named C-USA’s Player of the Year. NBA-bound Adonis Thomas will carry this club before hearing his name called as a lottery pick in June’s draft. Surprises aren’t always pleasing. Has there been a more disappointing Tiger to earn all-conference accolades? (Thomas was named to C-USA’s third team, in itself a disappointment.) Entering his sophomore campaign, Thomas intended to show fans (and importantly, pro scouts) what he wasn’t able to show them during a freshman season compromised by injury. Reasonable expectations would be for the former McDonald’s All-America to average 16 points and six rebounds. He averaged 11.7 and 4.5. Worse were the random disappearing acts. On four occasions, Thomas played at least 20 minutes and grabbed nary a rebound. If you were ranking “go-to” players for the 2012-13 Tigers, Thomas — not so long ago considered a future lottery pick — would be no higher than fourth. D.J. 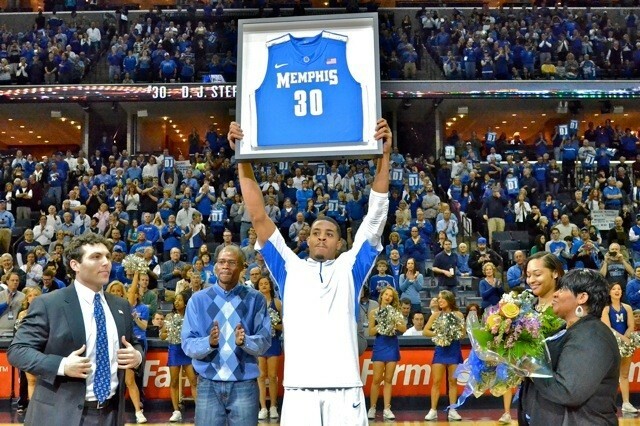 Stephens is a sweet role player and the star of Memphis Madness. But perhaps worth a redshirt season as a senior. You surely know his story by now. 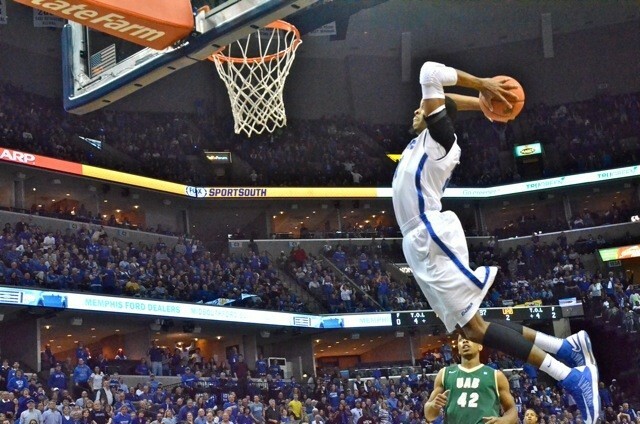 From “zero star” recruit (according to Pastner) to C-USA’s Defensive Player of the Year, a rim-kissing highlight reel who blocked shots into popcorn vendors and decided how he would deliver a dunk in mid-flight. Stephens saw his playing time increase from 8.3 minutes as a junior to 23.6 this season. He led C-USA with 95 blocked shots and personified the commodity Pastner holds dearest: energy. Perhaps the greatest surprise of all coming out of this Tiger season is the fact D.J. Stephens is on the NBA radar. Should he make The Association, few will have traveled further to do so. The team’s only all-conference player is junior center Tarik Black. 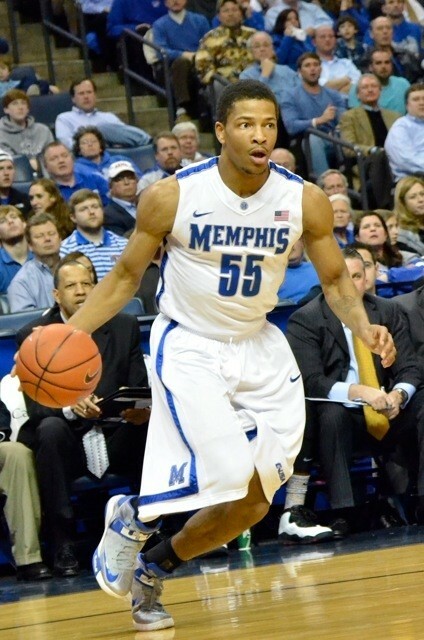 The pride of Ridgeway High was the only Memphis player to make C-USA’s preseason all-conference team. At season’s end, four Tigers made at least the third team, and none of them were named Tarik Black. Showing leadership since he arrived as a freshman, Black was named a captain (along with Jackson and Chris Crawford) at the start of the season. He then walked out of a practice and found himself suspended for the team’s sixth game of the season. Coming off the bench for freshman Shaq Goodwin, Black never found a groove, his scoring average dropping from 10.7 as a junior to 8.1 and his rebounds from 4.9 to 4.8 (though in five fewer minutes per game). The most likeable Tiger this side of Stephens, a motivated Black could prove invaluable next winter. Geron Johnson is trouble walking, a time bomb. Kicked off three teams before he arrived in Memphis, Johnson seemed to defy “the Pastner way”: all positive, all the time. As things turned out, Johnson became the proverbial “glue guy” for these Tigers, the team’s defensive stopper (ask Saint Mary’s Matt Dellavedova) and a player ready and willing to bury shots with a game in the balance. On the road against Tennessee, SMU, and Southern Miss, Johnson drained clutch three-pointers when the Memphis lead had all but disappeared. And let’s remember he spearheaded the only Tiger run last Saturday against Michigan State with a pair of treys late in the first half. If Stephens represents “the great story” of this season, Johnson isn’t far behind as a very good one. Shaq Goodwin will bring size and strength that pushes this team into the realm of elite. He started 33 games as a freshman (and the Tigers won 29 of them). He pulled down 12 rebounds in his sixth college game and scored 20 points in his seventh. So why does it feel like we didn’t see the entire Shaq package? His 7.4 points per game were seventh on the team. His 4.4 rebounds were fifth (and fewer than Johnson’s 4.6). Goodwin scored 10 points in but two of the Tigers’ last 15 games and was a nonfactor in the two NCAA tournament contests (zero points and three rebounds, combined). Much is expected of McDonald’s All-Americans. Goodwin may deliver yet, but he fell short as a freshman. Chris Crawford is solid in several areas, but will never be a difference-maker. Most athletes yearn for a game — one game — in which they can say they were The Man. For three games in three days in Tulsa earlier this month, Crawford — C-USA’s Sixth Man of the Year — was, indeed, The Man. The Tigers don’t win their third consecutive (and final) C-USA tournament without Crawford averaging 25.7 points and burying 19 three-pointers in wins over Tulane, Tulsa, and Southern Miss. He scored 11 points in the two overtimes against the Golden Eagles to prevent a loss that would have killed the team’s seeding for the NCAAs. In fact, Crawford’s was the most electrifying performance from any of the program’s seven C-USA tournament championships. Had that same Crawford shown up in the NCAA tournament (total of 11 points and one trey), this season recap may have appeared later. By my count, there are 256 basketball teams that play in cream-puff conferences (it’s time we acknowledge the Atlantic 10 as a power conference). Exactly two of them won 30 games. Alas, Gonzaga has begun its offseason as well. Can a 31-5 team be considered a disappointment? That’s for you to decide. But predictable? No way. The Tiger season came to a close Saturday afternoon in Auburn Hills, Michigan, Memphis falling to 9th-ranked Michigan State in the third round of the NCAA tournament. The U of M finishes the season with a record of 31-5, while the Spartans (27-8) advance to the Sweet 16 for the 11th time under coach Tom Izzo. Spartan guard Gary Harris scored 14 points before halftime and finished with a career-high 23 to lead all scorers. Dreadful shooting — and a Spartan team that dominated with size and defensive pressure — doomed the Tigers. Memphis took 63 shots and missed 44 of them, the team's most misfires in a game this season. After starting the game four-for-16 and falling behind 26-13, the Tigers rallied with a 16-6 run before halftime. Geron Johnson hit a pair of three-pointers and senior forward D.J. Stephens blocked three shots to fuel the rally, which proved to be the last positive development of coach Josh Pastner's fourth season. Coming out of the break, Memphis missed nine of its first ten shots, fell behind by 11 (43-32 with 12:45 to play) and things never improved. MSU big men Derrick Nix (13 points, 7 rebounds) and Adreian Payne (14 points, 11 rebounds) dominated at both ends with an all-too-predictable shut-down of their Tiger counterparts, Shaq Goodwin (scoreless with two rebounds) and Tarik Black (six points, two rebounds). The Spartans pulled down 41 rebounds to the Tigers' 25. Junior guard Geron Johnson led the Tigers with 16 points and Joe Jackson added 12. No other Tiger scored more than six. Chris Crawford — the player who hit 19 three-pointers in three games at last week's Conference USA tournament — was 0 for five from three-point range. The Tigers enter the offseason with six of seven rotation players eligible to return and with one of the top-ranked recruiting classes in the country on the way. At least three of those recruits — Nick King from East High School in Memphis, Austin Nichols from Briarcrest, and Kuran Iverson from Windsor, Connecticut — are expected to be in Pastner's 2013-14 rotation. Sophomore forward Adonis Thomas has long been expected to enter June's NBA draft, but his prospects have plummeted with a disappointing season. Today's loss ends the college career of D.J. Stephens. C-USA's Defensive Player of the Year was a part of 106 victories as a Tiger. Consider the first monkey of Josh Pastner's young coaching career safely removed from his back. With a narrow escape this afternoon in Auburn Hills, Michigan, the Memphis coach earned the first NCAA tournament win of his career. Now 31-4 on the season, the U of M advances to the third round of the Midwest regional, where they'll face 9th-ranked Michigan State. The Spartans (26-8) beat Valparaiso, 65-54, on the same floor where the Tigers and Gaels played. The Tigers utilized a 19-2 run over a nine-minute stretch of the first half to take a 28-13 lead. Back-to-back three pointers by Adonis Thomas and Joe Jackson keyed the run, along with five points from Tarik Black on consecutive possessions less than four minutes before halftime. The Gaels' star point guard, Matt Dellavedova missed six of his eight shots in the first half and Saint Mary's misfired on all six of their three-point attempts before the break. In the second half, the Tiger offense froze, scoring only four points in over eight minutes of action. 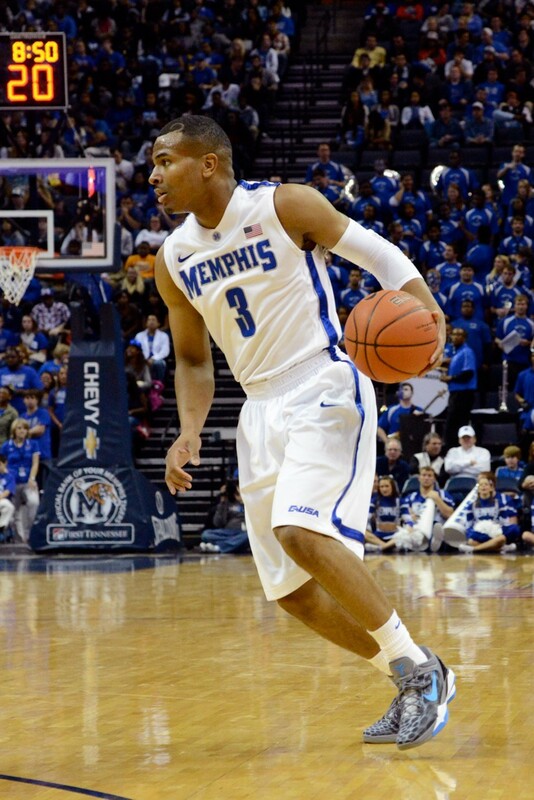 The Gaels drew within three (36-33), before Memphis countered. A dunk by D.J. Stephens (over Dellavedova in the snapshot of the game) and a three-pointer from junior guard Chris Crawford (his first points of the game after an MVP weekend at the Conference USA tournament) gave the Tigers a 44-35 lead with seven minutes to play. His team down four with 4:15 to go, Dellavedova went to the foul line and missed the first of a one-and-one. When Joe Jackson followed with a trey from the top of the arc, the Tigers had a seven-point cushion (47-40). They would need virtually all of it over the game's final four minutes. A pair of missed free throws — one by Jackson, another by Stephens — kept the Gaels close enough for desperation shots inside the final minute. When just such a shot by Eividas Petrulis— from behind the arc, off the glass — fell threw the net with 1.9 seconds to play, the Memphis lead was reduced to 54-52. Making matters that much worse, the Tigers turned the ball over on the ensuing inbounds play, a pass from Thomas deflecting off Jackson's hands. Dellavedova received the inbounds pass that followed and overshot a three-point attempt at the buzzer. The loss was the first for Saint Mary's to a team not named Gonzaga since Christmas. The win for Memphis is the program's first in the NCAA tournament since 2009, and the first in three attempts by veterans Jackson, Black, Crawford, and Stephens. Jackson led Memphis with 14 points, while Thomas and Black added 12 each. The Tigers blocked 12 Saint Mary's shots, eight of them by Stephens, C-USA's Defensive Player of the Year. Memphis has beaten Michigan State in the only two meetings between the schools, the last coming in the 2008 NCAAs. With one monkey removed from Pastner's back, here's another: he's 0-11 against ranked teams. The NCAA basketball tournament is a cruel event. No other sport requires a team play so many games to qualify, then delivers a series of pass/fail tests to earn a championship. One off night from your best shooter . . . season’s over. Foul trouble for your inside presence? Done. The opponent’s reserve shooting guard heats up from three-point country? Finito. 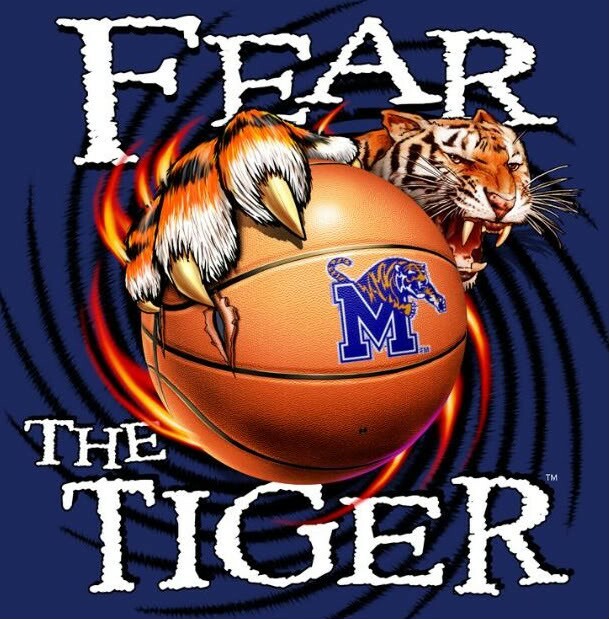 Talk in Memphis this week will center around a “must-win” Thursday, that if the 30-4 Tigers happen to fall to St. Mary’s or Middle Tennessee (teams that square off Tuesday night for the right to face the U of M), the season instantly goes down the tubes as a failure. The line of thinking is cruel . . . and honest. But it really applies to most of the 68 teams in your bracket this morning. Should the mighty Louisville Cardinals lose before the Final Four, Rick Pitino will join John Calipari in a Bluegrass State doghouse built for two. When teams lose to lower seeds this Thursday and Friday (and they will), they’ll go home with the same scarlet letter — “D” for disappointment — Memphis fans fear so greatly. It’s not all that unique. Except it is for Tiger Nation. Conference USA has been summarily kicked out the back door, collectively victimized by a 19-0 farewell tour led by Player of the Year Joe Jackson, Coach of the Year Josh Pastner, and Defensive POY D.J. Stephens. Their reward? Could be a matchup with a program (MTSU) joining C-USA next season. The NCAA tournament is cruel, particularly when fate is twisted in knots of irony. Heaven forbid Memphis should fall to the Blue Raiders. With Tennessee and Vanderbilt safely dismissed by the selection committee, the Tigers are, at the very least, atop the state’s basketball pecking order. A must-win Thursday? If it’s the boys from Murfreesoboro on the other bench, put it in bold type. All caps. • Should the Tigers advance to a second game (the “third round” as defined by the NCAA) and face Michigan State in Auburn Hills, you’ll be able to hear pressure released like that of an overheated steam engine. No chance for Memphis against the Spartans in what amounts to a road game. Tom Izzo will coach circles around the Tigers’ boy wonder. Twenty-five wins in the Big 10 vs. thirty in C-USA? No contest. It’s precisely the kind of game the Tigers should welcome. They’ve played with chips on their shoulders since bumbling around the Bahamas last November. Let it loose. • There is no weapon in basketball like a hot shooter. And there aren’t many hotter entering the tournament than the Tigers’ Chris Crawford. Finally living up to his uniform number, Crawford has connected on 40 three-pointers in the Tigers’ last nine games (after hitting but 17 in the previous 17 games over two months). Needless to say, he’s the factor any Memphis opponent will consider most threatening this week. Crawford missed all five of his long-distance attempts last year against Saint Louis in the Dance (and hit two of five as a freshman against Arizona). If you’re taking the Tigers’ temperature early in Thursday’s game, focus on Crawford’s shooting touch. • For each of the 68 teams in the field, there are three possible scenarios to every game: a blowout victory, a blowout loss, or a game that could go either way. The most likely, of course, is the third possibility. Which makes the Tigers’ double-overtime heart-stopper in last Saturday’s C-USA championship game the perfect dress rehearsal for the NCAAs. Maybe the Tigers win a blowout Thursday. Perhaps they get blown out (unlikely). But I don’t see them getting rattled on the big stage late in a tight game. Geron Johnson has made shots when things are tight. So has Joe Jackson and, for crying out loud, Chris Crawford. I see these Tigers as more battle-tested than the national analysts who can’t peer beyond the C-USA affiliation. • Pastner has been forced to use what amounts to a seven-man rotation since Antonio Barton’s foot injury in early February. If the coach has a roster concern entering the tournament, it has to be the center position. Forget possible foul trouble to Shaq Goodwin or Tarik Black. When will one of the Tiger big men again have real impact on a game? Foul trouble or otherwise, it’s hard for two players with the talents of Shaq and Black to combine for two points in 50 minutes as they did in the C-USA title game. Goodwin pulled down seven boards against Southern Miss, his first game with as many as six since January 30th. Black has scored as many as 10 points once since January 22nd. Standard hoops theology says guard play wins in March. But particularly with Michigan State looming, a Tiger big man needs to play big. • Back to that “must-win” scenario for the Tigers. Since Memphis won its first NCAA tournament game in 1973, the program has endured two droughts longer than three years without a win in the Dance, each of them spirit-threatening eight-year periods (1974-81 and 1996-2003). A loss Thursday would extend the current drought to four years and make for the longest offseason of Pastner’s still-young career. The NCAA tournament is a cruel test, indeed. Not since 2003 — when they played in The Pyramid — had the Memphis Tigers' drawn as large a crowd (of players) for Senior Day as they did in today's regular-season finale at FedExForum. The pregame ceremony stirred 18,289 Tiger fans as it always does, and three of those seniors — Charles Holt, Stan Simpson, and Ferrakohn Hall — received a farewell ovation unlike any they'll ever experience again. For the fourth senior, though, it must have seemed like your average home game . . . just turned up a notch. "It was the perfect day for me," said that senior, forward D.J. Stephens. "To have all four of us on the court near the end of the game, and getting the win." The Tigers allowed an overmatched UAB team within a single point (45-44) before erupting for 41 points in a 12-minute span to secure their 27th win of the season and complete a 16-game whitewashing of Conference USA. The win ends the 18th and final regular season for Memphis as members of C-USA. They'll travel to Tulsa next week for the league tournament, opening with a quarterfinal game on Thursday. 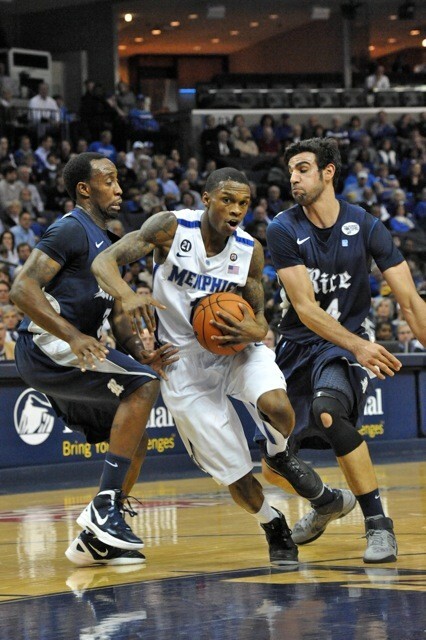 "To go 16-0 in league play is special," said Tiger coach Josh Pastner after his 102nd win as Memphis coach. "You don't take that for granted. Tremendous win. And the way the season started, with lots of darts and arrows being thrown at us. You appreciate this; it isn't a birthright. We have tremendous young men, academically, socially, and athletically." Junior guard Joe Jackson did all he could to steal the spotlight from Stephens, falling but a rebound shy of the program's fourth triple-double. Teammate Chris Crawford (who scored a game-high 20 points) pointed out that Jackson wasn't all that far from a quadruple-double: 17 points, 10 assists, nine rebounds, and six steals. "Joe was awesome, with a capital A," said Pastner. "He dominated on 50-50 balls today, and that's what this team is about." Rounding out the guard-dominated performance for Memphis was junior Geron Johnson with 19 points, four assists, and three steals. As a team, the Tigers picked up 22 assists on the 30 field goals they converted, a percentage that keeps the head coach smiling. As for Stephens, the Texas native finished one of the most unlikely seasons in Memphis history by scoring 13 points (on five of six shooting) and grabbing eight rebounds and three steals. After the final buzzer, Stephens delivered a parting kiss . . . to the rim on his team's side of the floor. D.J. Stephens as we like to remember him. "Everybody kept telling me to kiss the tiger [logo at midcourt], but that's been done before," said Stephens. "A couple of days ago, Shaq [Goodwin] jumped to see how high his head could get. I went right after him, and when I jumped, I actually looked down at the rim a bit. Man, that was kind of cool. I just wanted to be remembered for something different." The win ends an annual series between Memphis and UAB that dates back to the 1990-91 season, a series the Tigers have dominated (35-10), but one special to fans of both programs for the connection to the late Hall of Fame coach, Gene Bartow. Did the meaning of the game — and his unique senior moment — make for an emotional afternoon for Stephens? "I was actually more happy than anything," said Stephens. "To be able to walk out there with the people who brought me into the world, and my girlfriend . . . my future wife. She's pregnant, so in a way she walked out there with our child. For them to be with me in a moment like that, it means a lot." When Memphis fans reflect on the Tigers' pending exit from Conference USA, the team fans may most rejoice in leaving behind: the UTEP Miners. Whether in the cozy quarters of FedExForum or at the Don Haskins Center in El Paso, UTEP has been the splinter lodged quasi-permanently between the toes of the Tiger basketball program over the last four years. Though one more C-USA tournament remains to be played, Memphis may have finally removed the splinter with tonight's 56-54 escape in Texas. A game that featured 15 lead changes wasn't decided until UTEP's Jacques Streeter missed a desperation heave just inside the midcourt stripe as time expired. Streeter stole an inbounds pass intended for Joe Jackson after the Tigers had retained possession following a missed free throw by Tarik Black. The splinter was that stubborn. The win was that ugly. Junior forward Adonis Thomas hit a three-pointer to give the Tigers the lead for good (54-51) with just under three minutes to play. Down 56-53 with 5.3 seconds left, the Miners had a chance to tie the game when Black fouled UTEP's C.J. Cooper well behind the three-point arc. But Cooper missed the first of three free throws (and intentionally missed the third, which was rebounded by Black). Chris Crawford came off the bench and led the Tigers with 15 points, while Thomas added 11 and nine rebounds. Geron Johnson contributed with 10 rebounds, seven assists, and three steals. Senior forward D.J. Stephens was limited to eight minutes of playing time by an aggravation of his asthma condition. The win improves the Tigers' record to 26-4 and 15-0 in Conference USA play. A victory this Saturday against UAB at FedExForum (on Senior Day) would give the U of M its fourth undefeated season atop the league it leaves behind with next week's tournament at Tulsa. 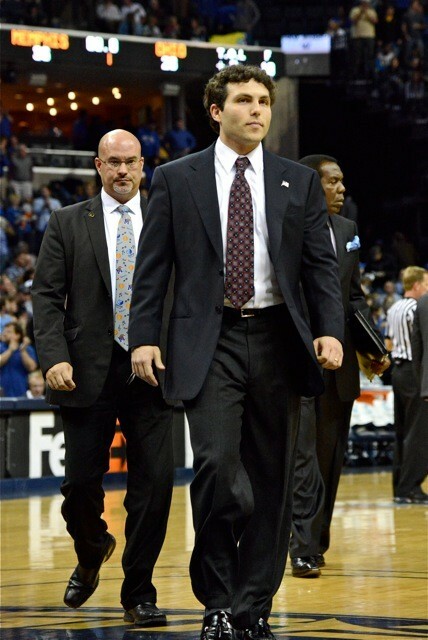 Among the teams coach Josh Pastner would prefer not facing in the C-USA tourney? The UTEP Miners. • Last Tuesday’s loss at Xavier may have proven, once and for all, that Conference USA is college basketball’s kiddie pool. The league champion — 13-0 against its conference brethren — travels to face a foe sixth in the Atlantic 10, minus its point guard . . . and loses? There will be no sugarcoating the defeat come Selection Sunday for the NCAA tournament. The Musketeers lost to Pacific (at home). They lost to Vanderbilt (at home). They lost to Wofford (at home). But they beat the C-USA-champion Memphis Tigers. The Tigers returned to C-USA competition Saturday at UCF, played dreadful basketball for the first ten minutes of the game . . . and led by five at halftime. What a difference a league makes. • If you think the loss at Xavier on ESPN2 hurt the nation’s impression of the Tigers, imagine what a loss to a C-USA opponent might do. If coach Josh Pastner felt pressure to win in Cincinnati last week, he should know that the last two games on the Tigers’ regular-season schedule (at UTEP, UAB) and every game Memphis plays in the C-USA tournament (save the championship . . . maybe) is a must-win. Let’s say the Tigers finish the regular season 27-4 (undefeated in C-USA) and suffer a monumental upset in the C-USA tourney quarterfinals. That would inspire some lengthy discussion in the NCAA selection room. The loss at Xavier eliminated any margin for error the Tigers may have enjoyed. They must hold serve and get out of the kiddie pool for good. • Evidence that pressure to perform at Xavier entered the Tigers’ heads: 12 missed free throws in 18 attempts. You would have thought John Calipari stood on the sideline as one Tiger after another left points behind by damaging the rim with a foul shot. A team that had made 20 of 24 freebies in its previous game could hit only one third of its shots from the charity stripe. (They weren’t much better at UCF, hitting 12 of 21.) D.J. Stephens entered the Xavier game shooting 71 percent from the line. He made one of seven shots, missing a critical pair late when the game was very much there to be won. Geron Johnson — a 74-percent free-throw shooter — missed the front end of a one-and-one near the end. How does a player bury three long-distance shots to bring his team back . . . and miss a critical free throw? It’s all between the ears. • Is it possible for a team to go undefeated in its league and not have the league’s player of the year on its roster? Could happen with these Tigers. The U of M’s top scorer, Joe Jackson, is 13th in C-USA (13.9 points per game). The Tigers’ top rebounder, D.J. Stephens, is 12th in the league (6.8). The team’s top pro prospect may be Geron Johnson, but are his numbers (10.4 points, 4.5 rebounds, 3.3 assists) POY stuff? Tulane’s Josh Davis could lead the league in both scoring and rebounding. Preseason POY Keith Clanton of UCF has hardly been a disappointment (15.3 points, 8.6 rebounds). Tulane and UCF could each finish the season with 20 wins (kiddie pool alert), perhaps enough to earn their guy a trophy. • The memory of last year’s one-and-out loss to Saint Louis in the NCAAs is all too fresh among Tiger fans. Then came VCU last November and now a crushing loss at Xavier. Tiger faithful may be thrilled to be leaving C-USA behind. They may be just as glad the program isn’t joining the Atlantic 10. The Tigers played the first six minutes of today's game at UCF with a lingering hangover from their deflating loss at Xavier last Tuesday. Boosted by the energy of Senior Day, the Knights stormed out to a 14-4 lead as Memphis missed 10 of its first 11 shots. UCF still led with 5 minutes to play before halftime (21-20), but the Tigers closed the half on a 14-8 run thanks largely to 11 points in four minutes from junior guard Chris Crawford (nine of them on three long-range jumpers). UCF tied the game at 38 early in the second half when Knight senior Keith Clanton — the program's career leader in games played — scored nine straight points. But the Tigers gradually pulled away, extending their lead to nine (52-43) on a Joe Jackson trey with 12:30 left in the game. Jackson and Crawford each scored 19 points for the game while Adonis Thomas added 12. Clanton led all scorers with 29 points on 10-of-15 shooting from the field. The Tigers were able to rattle their hosts with defense, picking up 10 steals and forcing a total of 15 turnovers. Crawford had three thefts and junior center Tarik Black picked up four before fouling out late in the second half. The victory improves the Tigers' record to 25-4 and gives coach Josh Pastner the 100th win of his four-year career. (Pastner will turn 36 in September.) Memphis is now 14-0 in Conference USA play with two games remaining in the regular season: Tuesday at UTEP and next Saturday when they host UAB at FedExForum for Senior Day.